Description Binary opposition is a central precept of ancient Panamanian cosmology, which viewed the cosmos as the pairing of opposites: male-female, light-dark, spirit world-natural world. The universe was composed of three levels-the upper sphere, the middle sphere, and the lower sphere. The latter was associated with the female domain and was mirrored in the upper sphere, the domain of the male principle. Decorative motifs, especially certain geometric forms frequently found on painted ceramics, likely had symbolic meanings, although their significance has largely been lost. Perhaps, too, some forms encompassed esoteric knowledge that was not intended for the uninitiated. Regardless, the dynamic imagery that characterizes the Conté and Marcaracas pottery styles is cognitive in its intent and likely reflects fundamental principles of indigenous religious beliefs and cosmology. The pedestal dish is decorated with a bilaterally symmetrical portrayal of a shaman in magical flight. Having taken his animal spirit form, here a bat, the shaman's ability to traverse the cosmic realms is implied by his portrayal in mirror image. Only a hint of the shaman's human self remains in his face; otherwise the transformation into a bat is complete with outstretched, featherless wings, and sinuous clawed feet. 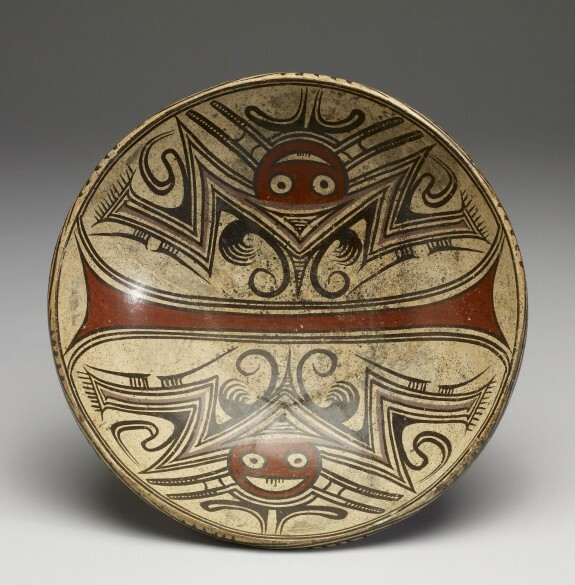 Exploring Art of the Ancient Americas: The John Bourne Collection Gift. The Walters Art Museum, Baltimore; Frist Center for the Visual Arts, Nashville. 2012-2013. Provenance Private collection, California; Ron Messick Fine Arts, Santa Fe, New Mexico [date and mode of acquisition unknown]; John G. Bourne, February 15, 2005, by purchase.